The Language of symbols can be understood and recognized on many different levels: visual, contextual, mythic and philosophic. Although much of the esoteric tradition was kept hidden by the priestly class of Druids, the artists and the bards – poets, musicians and storytellers, wove mystical elements within their words and images. Well-crafted images communicate the Mystery that is life, spirit within form. Authentic symbols can be experienced on both conscious and unconscious levels, through instinctual as well as intellectual understanding. To perceive more deeply we can learn the language, but more importantly, they are felt through the heart, and experienced through the soul. This opens the communication of ideas on a nonverbal level to all people throughout history, including the majority who could not read or write, but who could relate to, and draw from this visual tradition. The symbol may be complex, yet there is both a conceptual and intuitive vocabulary at the foundation. 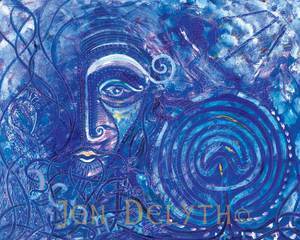 Oghma is the Celtic God of language and communication who created the Ogham alphabet. The Celts curiously imaged him with finely crafted chains connecting his tongue to the ears of his smiling people. The power of eloquence binds us to the mystical persona; compelled we hear his secrets whispered through the long chain of years. 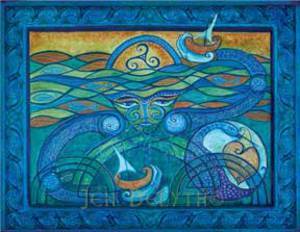 The artwork and design language of the Celts communicate ideas of a more fluid relationship between things. At the heart of the imagery is a sense that all is multi-dimensional and interconnected, that there is a mystical and colorful spiritual world beyond the hardships of everyday life. This is an art form that embraces creative interpretation, has affinity for ambiguity and profundity. It always intrigues, suggesting something of that which we cannot always see, but can often feel within the complexities of the world. The Mystery of a world that is alive, from which we come, and to where we return.